We worked with TPN Retail to provide various digital display spots for Bank of America retail branches across the country. All the content involves auto-updating information and animation. The rate boards display the current banking rates offered at Bank of America. The rates differ by state and must be updated and reviewed quickly to ensure the board is always presenting accurate numbers. Twitter feeds dynamically populate the content in this spot. Content and functionality was updated every time the spot was used. Real time traffic information is provided showing location-specific updates. The background image changes based on the time of day. In supporting the Chicago Marathon, a countdown spot was created as well as a twitter feed display showing the latest 3 tweets. Co-sponsoring with NIKE, Bank of America encourages donation toward the (RED) Campaign. 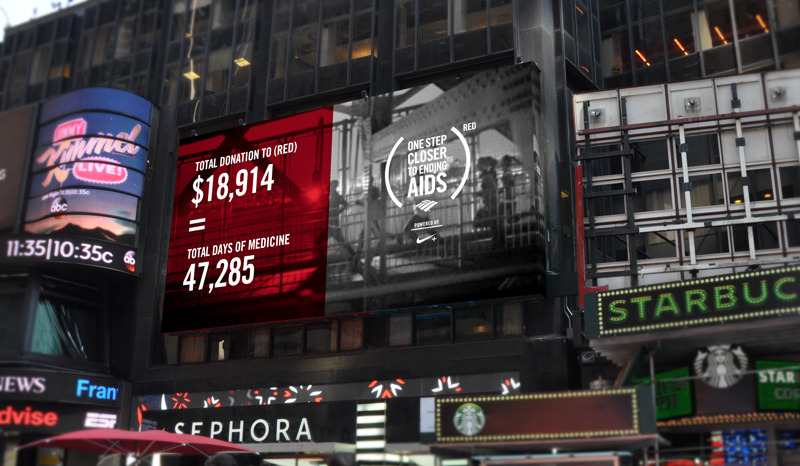 This is a twitter feed spot displaying the latest related tweet, meanwhile in Times Square, the Bank of America Billboard features a video ad showing the current fundraising status. Tiger Party helped install the billboard sign in Times Square by providing specs and requirements. Additionally, Tiger Party installed the hardware, developed a service landing page, and provides monthly usage reports for a WiFi hotspot at the sign.